In recent years I have received condemnation and censure for blog posts that I have written that criticize “Lean,” the MIT research that resulted in “Lean,” the work of James P. Womack and Daniel T. Jones, and the work of the Lean Enterprise Institute and the Lean Enterprise Academy. My motives have been questioned as well. Interestingly, I have received little or no criticism based on the merits of my arguments. My criticism of Womack and Jones’ work is the apparent problem. But when asked, people say the actual problem is the tone of my writing which can seem as if I am making personal attacks. But, I am not. The tone of my writing is tough because people’s lives and livelihoods are at stake – for example, workers laid off due to Fake Lean, speeding people up, etc. A tough tone is nothing compared to the real-life pain that so many workers have had to endure since Lean emerged in 1988. What is Lean Without Respect for People? Is Lean the Same as TPS? Criticism is healthy for Lean because it makes people think and improve their practice of Lean, and it is consistent with “Continuous Improvement and “Respect for People.” More people should do it. The criticisms in my blog posts and other works are written from a scholarly perspective. Scholarly criticism is critical thinking and must never be confused with blame. In Lean, critical thinking is called asking “Why?,” and we are taught to ask “Why?” to always challenge conventions and preconceptions. That’s what we do, isn’t it? 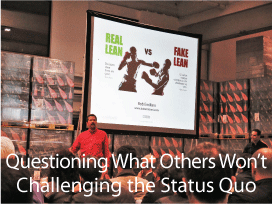 Lean emerged from scholarly work performed at Massachusetts Institute of Technology. Anyone whose name is associated with a scholarly work (e.g. Womack and Jones) is subject to scholarly criticism by scholars and others. Criticism can have the appearance of ad hominem attacks, but they are not that at all. People who present themselves as scholars and who are also leaders in a given field are, naturally, targets for close scrutiny of their work, and criticism of their work will necessarily be associated with their name. There is no avoiding that. Arguing the merits of someone’s work necessarily requires the identification of those who did the work. Criticism, by its nature, cannot be politically correct, because that would render it useless – as in, everyone’s facts and opinions are correct, which is nonsense. Criticism is a value-laden activity for moving a field of knowledge forward because it helps people recognize problems, think, and prompt them to do research and explore new ideas. My father was a renowned scientist, and I know a lot about his work. The written criticisms that the researchers in his field leveled at each other were very aggressive in regard to theory, method, and interpretation of experiment results. They were respectful, but not necessarily polite. And they never engaged in ad hominem attacks. Their criticism was mostly based on facts, but opinions also informed their criticisms of each other’s work. That’s how science evolves in the search for truth. The scientists in my father’s field were good personal friends with shared interests and a who accepted the great responsibility to advance their field of science, which they took very seriously. Service to the science stood far above personal gain. They met at major conferences a few times a year, gave talks, withstood questions and criticism face-to-face. When that was over, they went to the bar for a few drinks. After that, dined together, and then drank more beer until late into the night. They were inclusive and invited the younger scientists to join them whenever possible, and usually paid for their meals and drinks. They would visit each other’s university labs, give lectures to students, and dine in each other’s homes in the evening. There was some shop talk, but mostly it was eating, drinking, telling jokes, and recounting funny stories until midnight or later. Sadly, these important aspects seem to be missing among the leading figures of the Lean community. In my view, Womack and Jones’ work, and that of other MIT researchers, has many serious shortcomings – which perhaps you can ignore but a scholar cannot. They missed several key things that have proven to be very important in the practical application of Lean (e.g. kaizen, the existence of Fake Lean, Lean failures, and so on). While that is hindsight, it is still fair to criticize their work. For example, the work of Adam Smith is criticized to this day and will be in the future. I think something for which they can be criticized for, as I have pointed out, is failing to adjust, correct, or improve their work when evidence – primarily coming from others – presents itself. Womack and LEI and Jones and LEA have been slow to do this or, in some cases, (apparently) unwilling. The lack of responsiveness does not serve the community that depends on them or their customers. Advancing a field of study, whether its theoretical or practical aspects, is difficult. People are generally not receptive to the “odd views” that invariably inform criticism. At times, it can appear to some as distasteful or even ugly. And it is difficult to take criticism. But it is not rude, and disagreement should be welcomed as essential to the advancement of Lean. Criticism informs people about problems. It is necessary, even fundamental to human existence, as we seek to improve our condition. You can’t improve if you don’t know about problems. Don’t think all I do is criticize. Hundreds of positive and practical suggestion for improvement are contained in my 16 books, 25+ journal papers, and 200 other blog posts. Thanks Bob but I was always taught that ones beliefs are only as strong as all the criticism that one can be given. If you can uphold to that then you beliefs and values must be fairly strong…I also notice on several occasions how some who preach to be the know all and do all in the Lean world often do not or choose not to follow the principles of Lean themselves. It’s like do as I say, not as I do beliefs. This conflict of interest plays into the concept of fake lean as you call it and some like also to pick and choose what parts of Lean they feel is important at the moment. I can always tell from my humble life time experience when someone is genuine or fake with Lean. To me it is like someone writing about the battle on the battle field but never experiencing it for real themselves… Best Regards, Bill Ryan. Not too long ago (end of February 2016), we engaged in a somewhat brief discussion regarding the value that’s to be found in “scholarly” exchanges. It was (and still is) my contention that any such value-adding exchange should open the door to BETTER THINKING and BETTER BEHAVING. And in that regard, should NOT be subject to any ARTIFICIALLY OR SUBJECTIVELY IMPOSED CONSTRAINTS (i.e., In your own words…”The nature of a comment or remark is brevity. I always believe there is much good in author’s work to edit for consolidation and clarification. Also, I reserve the right to edit comments to my blog posts for brevity and clarity….) regardless of the “OWNERSHIP” of the exchange channel; especially when such a channel is open to public participation. In your post above, as is so typically the case, there is not much in the way of evidence for consolidating and clarifying your position. And in that context, any attempt at brevity has most certainly been thrown out the window. Why might it be germane to point out these facts? Well, when it comes to “eating one’s own dog food” I believe that that ability to withstand – and even embrace – a contrarian point of view is something that ALL self-proclaimed LEAN ADVOCATES AND PRACTITIONERS should be capable of doing. I think something for which they can be criticized for, as I have pointed out, is failing to adjust, correct, or improve their work when evidence – primarily coming from others – presents itself. Womack and LEI and Jones and LEA have been slow to do this or, in some cases, (apparently) unwilling. The lack of responsiveness does not serve the community that depends on them. It makes me believe that the same sort of THINKING AND BEHAVING should also be applicable to you. Yet, in past attempts to engage in the sorts of critical thinking and critical dialogue that are germane to TRUE LEAN THINKING AND BEHAVING, you have expressed resistance – and even a sense of having been offended – when confronted with attempts to “fully” express (without artificially/subjectively imposing constraints) an alternate perspective. I call it “content” and “delivery.” Some people have a valuable message to convey (“content”) to share with the world, but their delivery leaves much to be desired. I don’t think anyone disputes the fact that you make valid arguments in your discussions in Lean…I certainly enjoy reading them. But your delivery or style can be construed by some as derisive. Couple this with a smidge of arrogrance sprinkled in your writings (paraphrase: “I’m the only one who has been talking about Lean Leadership for X years”), and it’s not hard to understand the why some in Lean Community feel the way they feel. I am not a fan of sugarcoating either, but those who can deliver content in a way that makes listeners think “hmmm…that’s an interesting perspective. I’d like to hear more” will always be more successful in attracting an audience and changing minds. Thank you for your comment and the reality check. I do appreciate it, especially the latter. I always enjoy your articles. They are timely and relevant to uncover the mass deception that has taken place in the lean movement over the last decade. I agree and support your concept of Fake Lean. It does exist, I know this because during my consulting work I have seen it, and spent my hours trying to undo it. However, as many know, one can only work and maintain improvement to the lowest level that any management team is willing to rise too! Of course the tone can be a little sarcastic. But I grew up in Detroit and generally that is an effective way to get your point across. I worked for GM and Toyota and consider myself steeped in practical applications for both cultures and business strategies. I was doing Lean before they The Machine That Changed the World coined the phrase. F. Cho was correct and he would know because at that time Toyota was trying to transfer TPS to the US. As the president of TMMK, the first assembly plant in NA, he had the unenviable task to developing TPS at the plant and suppliers. At that time Toyota had 5 seperate groups working with NA suppliers. When Toyota came to NA the first thing they did was hire a consultant to develop TPS training materials because up to then none existed because they were not needed.